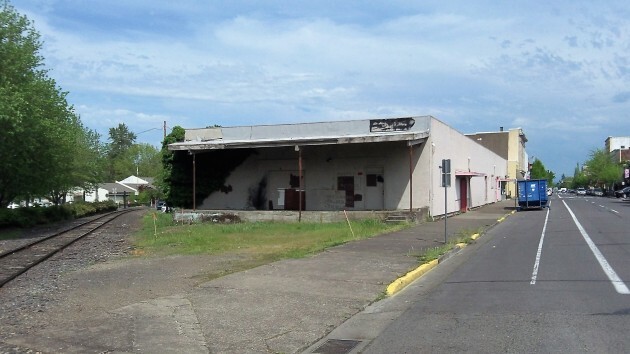 This former turkey processing plant between the P&W tracks and West First Avenue will give way to the new Albany Carousel. My notes say on this meeting say “yak… yak… yak,” which is shorthand for all you need to know about Wednesday’s discussion about the Albany Carousel’s request for $339,500 in urban renewal money. In the end, all but two members of the Central Albany Revitalization Area advisory board voted, as you knew they would, in favor of granting the request. As reported here Sunday, the carousel asked for the money to cover what it will have to pay in city development fees, to rebuild the sidewalk and streets outside its planned new building, and to get rid of the lead paint and the asbestos-laden floor tiles when its temporary building at First Avenue and Washington Street is demolished. The board’s back and forth centered on whether the carousel organization would continue to raise private funds (it will), and whether it can repay some of the CARA aid if it raises more money than it needs for its planned new building, estimated to cost $5.6 million. CARA has already given the carousel $300,000 to buy the property at First and Washington and $110,000 to design the new structure, intended to be an attraction or “anchor” on the west end of First Avenue. The additional money will be paid in the form of reimbursements for costs incurred for the three purposes identified in the request. If those things cost more, it’s the carousel’s problem. If they cost less, the city will pay only the amounts they cost. For the carousel, Dave Johnson and Gary Goby, MD, appeared before the CARA board. If I understood them right, the old turkey factory at First and Washington will start coming down about June 1. The carousel animals and other gear have been, or are being, moved to nearby Two Rivers Market. With luck, the new building will open in 2017. As a nonprofit organization with editorial and cultural aspirations, the carousel will be trying to raise money as long as it lasts. But it will also be a main attraction, bringing crowds to downtown Albany. Another piece of Albany’s Industrial Heritage gone. So sad. The coolest part of this building is the loading doors on the back side. It must have been fun to spot the cars on the sharply curving siding back in the day! An interesting perspective …. that image looking back from the normal traffic flow of life. Well, I’d say $750,000 is a drain not only on city finances, but the finances of every local taxing district that CARA skims money from – including the county, the state school fund, the vet’s home in Lebanon, and 4-H. And what happens if the carousel can’t sustain itself operationally? Will the city take over and bail them out? This is a sad situation because when the budgets of essential needs like county services, education, police, fire, library, and parks are drained to help fund the carousel, one has to question if city government is representing Albany residents responsibly. Is city government applying the right spending priorities here? And one has to wonder if the leaders of the carousel project have compromised their values. Clearly, the all-volunteer, privately-funded carousel project started out on the right foot. But somewhere along the line the lure of ‘free’ public money muddied the waters. Hard to be concise when one talks out of both sides of their mouth! This evening, I noticed the “cash for carousel” donation box was full at Albany’s Burgerville. Someone from the carousel effort should empty and bank that. Looks like I missed a good one . It’s called due process . If you can’t handle local hearings then I can’t see people being able to process what goes on at the state of federal level to be honest . Easy to complain . A little more effort to be that change maker we all feel is needed . Talk about yak , yak , yak … This blog .